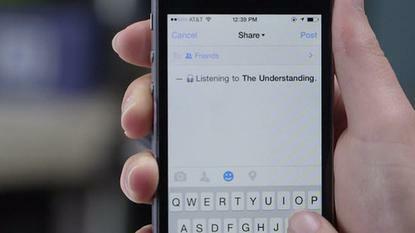 Facebook's new feature listens to ambient audio when people post status updates. acebook will soon be listening to its users -- literally -- but some of them wish it would cover its ears. The social network is in the doghouse again, this time for an upcoming feature that will allow it to listen in on its users via their smartphone's microphone. But the backlash might reveal more about people's declining trust in Facebook than about the feature itself. Facebook said last week it will soon introduce "a new, optional way to share and discover music, TV and movies." If users allow Facebook to access their microphone while they're writing a status update, the company will identify the content playing in the background and automatically include it. "That means if you want to share that you're listening to your favorite Beyoncé track or watching the season premiere of Game of Thrones, you can do it quickly and easily, without typing," Facebook said at the time. The feature will be made available on Android and iOS in the coming weeks. Some users were quick to flag it as a potential privacy violation and shared warnings -- on Facebook, naturally -- about its impending arrival. An online petition has also circulated, urging Facebook to kill the feature. It had received more than 500,000 signatures by Friday afternoon, according to a counter on the site. That's a lot of concerned people, though a fraction of Facebook's total base of 1.2 billion. The petition claims the app will allow Facebook to "listen to our conversations and surroundings through our own phones' microphone." It calls it a "Big Brother move," a "threat to our privacy" and "downright creepy." Facebook responded to a request for comment: "Sadly, an earlier version of this petition had several factual inaccuracies that have now been corrected. It’s unfortunate that the majority of people signed this petition before these corrections were made." But the protest may say more about people's confidence in Facebook than about the technology itself. There are already popular apps like Shazam and SoundHound that use the smartphone microphone to identify songs, but those apps haven't been subject to a similar backlash. Shazam also identifies ambient TV audio. Facebook's app can also identify TV shows and movies. Facebook will share what people are listening to or watching in their status update -- if they ask it to. But Facebook insists it has no interest in recording what you're saying. In response to the concerns, it updated its blog post this week to clarify that "Facebook isn't listening to or storing your conversations." The company says the feature records only a 15-second clip, that it converts to an "audio fingerprint" and sends to its servers where it tries to match it to fingerprints of movies and TV shows. "By design, we do not store fingerprints from your device for any amount of time," Facebook said. And the fingerprints don't include enough data to convert them back into the original audio, it added. It emphasized that the feature is optional: "Nothing changes about the way Facebook works if you choose not to use it," a spokeswoman said Friday. Facebook will keep a log of the songs or TV shows it matches on its servers, but they won't be connected to people's profiles, the company said. The social network needs to gather as much information about its users as it can, because it allows it to target advertisements more precisely. But the backlash is a reminder that privacy missteps it made in the past have caused some users to be skeptical of its motives.